My favorite time of the year has begun, and I have looked forward to this time since March. The anticipation has just been killing me up to this point, burning what feels like a hole in my chest. It has seemed as though the days on the calendar have really taken their time to turn, even though in reality, the time within each day has remained the same. 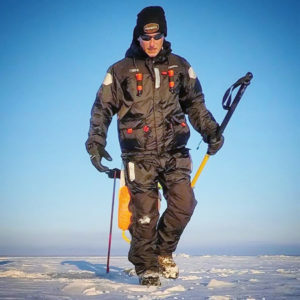 I look forward to this time as there are many factors in play, and to me, it’s not just the ice fishing, but the entire experience and the challenges first ice presents. First ice is challenging. 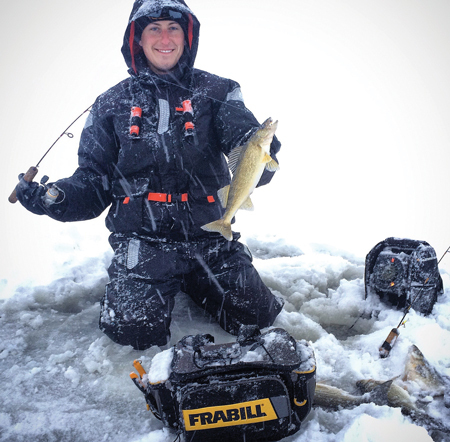 It takes a lot for an angler to be able to successfully, and safely, tackle the first ice fishing environment; a lot of it relies on preparation. As the temperatures are dropping, I am checking that “reliable” forecast coming in on my phone, hoping and praying for bitter cold numbers, with minimal wind. Here on the Winnebago System (as with a lot of other places), this optimal forecast has been pretty hard to find the last few years. Once I see something looking all purdy, such as a single digit temperature with a light and variable wind forecasted for a couple days, I’m ecstatic. With that being said, the last few years I have found myself to be devastated when the numbers change and we pop up into the upper 30’s, leading me to feel like sitting on a beach somewhere, and the wind speeds of 15mph, relating to hurricane force winds in my mind… Yeah, it’s not that bad, but I don’t know how else to explain the feeling. It all starts with a skim layer of ice. When it has been seen, the many trips to the bays and the Upper Lakes’ launches begin, along with the preparation. Prepare? What’s there to prepare for? A nice, balmy 40-degree day to mess it all up? Probably, but I’m sure a few of you go into preparation mode same as I do. The rods are checked and rechecked. The tackle is given a couple more once-overs, and the auger is probably started a couple more times in the garage, (just to let the neighbors know you’re ready). The watching and re-watching of YouTube videos climbs to new heights because you never know if you saw every detail. The one thing we do the most during this time is hope, hope for it to get here… now. On December 12th of last year, I made my way out onto Lake Poygan for the first time with a couple buddies. Looking at the lake before stepping foot onto it gave me a very desolate feeling. The only sound I heard was the small pieces of snow, gracefully dancing across the ice. Even though I have spent many hours on Lake Poygan over the years, this adventure, like all, needed to have all of the safety aspects addressed. I had my Frabill i-Float suit zipped and clipped, the phone was in a waterproof case, and a throw bag of rope was strapped to my hip… one CANNOT be too careful on the ice at any time of the season. With safety concerns addressed, Ryan and I had the spuds at the ready, while Jason carried the Nils auger as we stepped onto the hardwater of Lake Poygan for the first time that season. Poking and prodding, zigging and zagging, we moved in and around the easily visible (and hidden) ice variations; it definitely took some time. About an hour and a half in, we had done it. We had made it to some fishable water! What a workout, but it was needed as we had passed areas with open water to about 6” of ice. Standing out there, taking in a 360-degree view of what was around us… it was an amazing feeling. I couldn’t help but thinking that we might have been the first individuals to walk onto the hardwater on Lake Poygan that season, able to access fishing ground. So how was the fishing, you ask? Well, guess what, we didn’t even wet a line! We did all that work for nothing, right? No. This is what I’m getting at. First ice is an experience that I love. It challenges us in many ways, mentally and physically, to be able to feel the adrenaline rush of adventure. A few days later, that “reliable” forecast I previously mentioned came around and messed up the ice conditions on our system. With that, I was back on the hunt. Last year I wrote an article about traveling to find ice (from 2015) which lead us to Lake Nokomis. It was a fun trip, and certainly one full of learning. Well, we did the same last year, up into the same area but landed at Lake Alice this time. The warmer days leading up to the trip only gave us 6”-7” of good ice without any snow cover to speak of so the snowmobile was grounded and the walking adventures began. It was a fun trip and we caught some small walleyes but the feeling of getting onto the hardwater to get the lines wet for the first time was great. On the last day, we were blessed with a few inches of snow. This lead me to walking across lake, spudding my steps, and checking the ice thickness to make my own trail for my sled to get across the lake to the marked snowmobile trail on the other side. When that was accomplished, my wife and I jumped on the sled and got to experience some trail riding. It was her first time and she loved it… I thought maybe I could convince her that I “needed” to upgrade my old sled for this year. Tell me if I’m wrong, but if we don’t jump on the chance to take advantage of a situation such as this, we might miss the chance, right? At least that sounded like an optimal time to bring up the conversation… but it failed… for now. If presented with less than optimal conditions again this year, who knows where I’ll end up chasing ice this year during the first ice period. It’s always great to have backup plans in place in case our home bodies of water don’t freeze as quickly as we want. The hunt for first ice can take us to many locations and present us with some amazing experiences. Just like with everything else, you must work to be successful while chasing the feeling first ice can give you. If you want a fun adventure this year, I want you to do something. Pick out a body of water to fish this season that is within two hours from your house, preferably north as you have a better chance at getting better ice conditions earlier in the year. Plan for a shorter trip, a few days, so in case something goes wrong in what I’m suggesting, you won’t be wasting a full week or more. If it does pan out, you’ll be mad that I only suggested a few days. Either way, it will be an adventure, this I promise. With that said, make sure the body of the water that you pick out is something that is fishable and has somewhat of a reputation, as long as it’s a decent one. Then look into lodging. The place you stay certainly doesn’t need to be the Taj Mahal, just something to keep you warm and in an ideal location to the body of water you plan to target. Check out VRBO and local tourism websites for the best/cheapest deal. Once your lodging is set, pick up a topographic map of the body of water you are fishing and study it to its fullest. Do all of the online research you can do and make some calls to local establishments. Try not to solely rely on what bait shops tell you. You might think this sounds absurd to not include the top resource, but trust me, it challenges you more to learn, possibly new things at that, and that makes the experience so much more fulfilling when doing it on your own, at least in my book. Speaking from experience, if you go onto a brand new body of water and you are even the slightest bit successful, it will be an awesome feeling. I have seen joy-filled faces, including on the Winnebago System, when a rookie (which could be any one of us) gets to fish an active school of fish.